Carlos Eduardo Fernandes Soares de Melo1, Thiago Chianca Ferreira1, Teresa Cristina Mendes Higino2, Mayko Soares Maia2, Maria Carmela Cundari Boccalini3. stapes surgery, intraoperative complications, otosclerosis. Introduction: "Gusher" is a rare phenomenon that consists in sudden exit of cerebrospinal fluid during the course of stapedotomy or stapedectomy. Objective: To report a case of "gusher" during a stapedotomy and discuss the correlation with X-linked congenital syndrome. 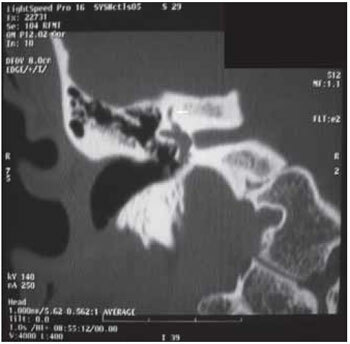 Case Report: Patient NT, 49 years old, Caucasian female with history of right unilateral progressive hearing loss for 18 years with worsening in the last 02 years with a diagnosis of otosclerosis. It was performed stapedotomy with sudden exit of cerebrospinal fluid after platinotomia, being carried out sealing the oval window fat ear lobe. Final Comments: This complication should be considered in cases of otosclerosis, where the preoperative diagnosis of perilymphatic hypertension is more difficult for X-linked congenital syndrome. "Gusher" is a rare phenomenon that consists in sudden exit of perilymphatic fluid during the course of the surgery platinotomia stapedotomy or stapedectomy (1). The etiology is a congenital malformation that causes abnormal communication between the perilymphatic space and the subarachnoid space. Can be detected by the presence of otorrhea or rhinorrhea tympanic perforation, sometimes associated with meningitis, but in most cases remain undetected for several years became evident during surgery. May present alone or associated with congenital X-linked syndrome The CT scan may be normal (2) or with alterations in the internal auditory canal, cochlea and facial nerve (3). In a study of stapedectomies Ginsberg et al demonstrated the "gusher" in 0.5% of surgeries (4). The impossibility of defining the clinical diagnosis associated with the absence of pathognomonic signs of the disease are major complications in the "gusher." Some intraoperative findings in vascularization and posterior crura of the stapes may suggest hypertension (5). In the event that the surgical termination still remains the mostly used (1). with a moderate degree of discomfort and sporadic vertigo. Showed a negative family history. 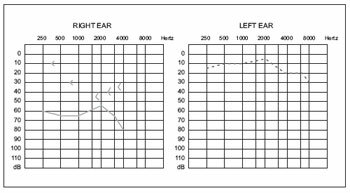 Otorhinolaryngological examination, otoscopy unchanged Rinne negative up to 1024 Hz in the right ear and Weber lateralized to this side. Rest of physical exam normal. 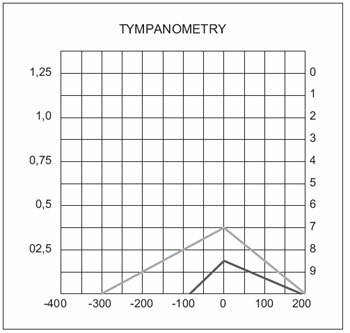 It was requested that audiometry showed mixed hearing loss on the right and "notch" of Carhart in the frequency of 2000 Hz and mild left sensorineural hearing loss above 6000 Hz down to 30 dB at 8000 Hz (Figure 1), bilateral absence of acoustic reflex and impedance curve with The bilateral type (Figure 2). Computed tomography of the temporal bone showed areas of bone demineralization in both optic capsules, prior to the oval windows in the topography offissulas before fenestration, associated with thickening of the platinum stirrups. Cochlea, vestibule, semicircular canals, cochlear and vestibular aqueducts no abnormalities (Figures 3 and 4). The diagnostic hypothesis was fixation of the stapes by otosclerosis probably right based on clinical history and physical examination. Prosthetics and surgery were discussed with the patient who opted for surgery (exploratory tympanostomy). The test of mobility of the ossicular chain was performed in the surgical procedure showing the fixation of the stapes. During microdrilling platinum output occurred CSF in large quantities, choosing not to stent insertion and sealing of the oval window fat right ear lobe. Despite this complication, the patient developed no other complications with improvement in symptoms of tinnitus and dizziness. We performed another CT scan and audiometry (Figure 5) which remained similar to preoperative examinations. Figure 1. 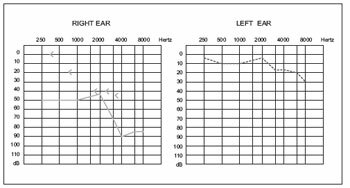 Preoperative pure tone audiometry. Figure 3. Tomographic axial image showing foci of otosclerosis in the right oval window. FFigure 4. Tomography imaging in coronal section showing the integrity of the right superior semicircular canal. Figure 5. Pure tone audiometry postoperatively. This syndrome occurs an anomalous connection between the subarachnoid and perilymphatic spaces. This connection can happen in two ways: extension of the cochlear aqueduct or internal auditory canal (1,2). This syndrome occurs when mixed hearing loss associated with the "gusher" has been recognized for years (2). 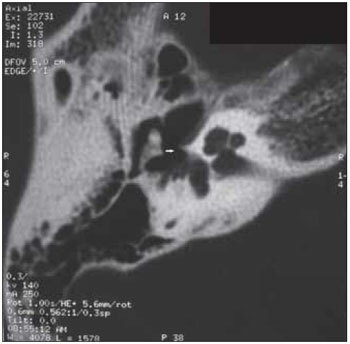 Computed tomography associated with this condition may be normal (2) or with alterations as enlargement of the lateral portion of the internal auditory canal, incomplete separation of the basal turn of cochlea of the inner ear canal and enlargement of the first and second part of the intratemporal portion of the nerve facial (2.3). Heterozygous women may have less severe radiological abnormalities and enlargement of internal auditory canal found most frequently (2). In a study of 2405 patients undergoing stapedectomies Ginsberg et al. demonstrated the occurrence of this phenomenon in 0.5% of surgeries (4). Most of the cases consisted of men who had the congenital syndrome linked to the "X" with mixed hearing loss associated with dilation of the internal auditory canal and / or defect at the base of the modiolus (4). In the absence of family history of mixed hearing loss linked to the "X", surgeons have difficulty in determining whether the patient has risk preoperative present perilymphatic hypertension. Imaging tests are conducted on the possibility of identifying changes that may predict the change, as found in this syndrome, but the phenomenon can be found in normal CT of the temporal bones even using the most modern techniques of image (2). Imaging studies play an important role in the diagnosis and monitoring of clinical otosclerosis. High-resolution CT is the radiological method of choice for assessing the window of the otic capsule and labyrinth. That tomography can accurately demonstrate activity or spongiotic lesions, which are visualized as a hypodense or radiolucent focus in the otic capsule (6). The inability to define the clinical diagnosis prior to surgery and the absence of pathognomonic clinical signs are the factors that complicate the diagnosis of "gusher" combined with otosclerosis (1) as in the case reported. CAUSSE et al. described two clues that may alert the surgeon to the possibility of the presence of a "gusher" before platinotomia: decrease of vascularization of the middle ear and abnormal insertion of the posterior crura of stapes (5). However, these signs are not specific enough to confirm the diagnosis (5). Syndrome linked to the "X" when it is suspected perilymphatic hypertension, it is suggested to avoid opting for surgery prosthesis. When there is profound sensorineural hearing loss can opt for a cochlear implant (3). In otosclerosis during stapedotomy or stapedectomy if there is a "gusher" to seal the oval window with a hemostatic sponge or fat is used and the persistence of output fluid puncture Lumbar should be considered (1). Some authors report a second surgical procedure for placing the prosthesis but with greater risks of cochlear degeneration (1). Perilymphatic hypertension or "gusher" is an important complication observed during stapedotomy or espedectomia. The inability to define the clinical diagnosis prior to surgery and the absence of pathognomonic clinical signs are the factors that complicate the diagnosis of "gusher" combined with otosclerosis. This complication should be considered in cases of otosclerosis, where the preoperative diagnosis of perilymphatic hypertension is more difficult for X-linked congenital syndrome. 1. Cassano P, Decandia N, Cassano M, Fiorella ML, Ettore G. Perilymphatic gusher in stapedectomy: demonstration of a fistula of internal auditory canal. Acta Otorhinolaryngol Ital. 2003, 23(2):116-9. 2. McFadden MD, Wilmoth JG, Mancuso AA, Antonelli PJ. Preoperative computed tomography may fail to detect patients at risk for perilymph gusher. Ear Nose Throat J. 2005, 84(12):770, 772-4. 3. Kumar G, Castillo M, Buchman CA. X-linked stapes gusher: CT findings in one patient. Am J Neuroradiol. 2003, 24(6):1130-2. 4. Ginsberg IA, Hoffman SR, Stinziano GD, White TP. Stapedectomy - In depth analysis of 2405 cases. Laryngoscope. 1978, 88(12):1999-2016. 5. Causse JB, Causse JR, Wiet RJ, Yoo TJ. Complications of stapedectomies. Am J Otol. 1983, 4(4):275-80. 6. Vicente AO, Yamishita HK, Albernaz PLM, Penido NO. Computed tomography in the diagnosis of otosclerosis. Otolaryngology - Head & Neck Surgery. 2006, 134(4):685-92. 1 Graduate Medicine.Resident Otolaryngology HSPM-SP. 2 Former ENT resident HSPM-SP.ENT. 3 ENT. Medical Assistant Department of Otolaryngology HSPM-SP and Hospital CEMA. Article received in March 17, 2009. Article accepted in May 24, 2009.